Yamunotri is the beautiful and charming place located in the midst of Gharwal Himalayas in Uttarakhand State. It is recognized as the source of Yamuna River and the seat of the Goddess Yamuna. Also, it is revered as one of the most important dhams among the Chardhams of India. Located at an altitude of 3293 mts, Yamunotri lies to the adjacent side of the Indo-Chinese border and is surmounted with the lofty peaks. It is one of the most important Hindu pilgrimages that is renowned for its thermal springs and glaciers. The locale of the Yamunotri is renowned after the sage Asit Muni, who believed to have resided here for years. The trip to this holy shrine departs the devotee with the thrilling and amazing experience. One can enjoy the picturesque surroundings, lush meadows and beautiful cascades on the way to Yamunotri and its nearby attractions. Here, devotees love to explore the Yamunotri temple dedicated to Goddess Yamuna and the thermal spring at Janki Chatt. Besides these, two hot springs gained enough prominence in the chapter of Yamunotri Dham; Surya Kund, which is known for its hot boiling water and Gauri Kund, which is known for its lukewarm water suitable for bathing. Every year, thousands of devotees turned to this holy shrine to get blessed with the powerful aura of the Yamuna River. The place offers a pacifying and mind soothing vibes to the devotee. As per the legendary sources, the story behind the Yamunotri lies with the story of the Sage Asit Muni. It was heard that Asit Muni takes a holy dip in both Ganga and Yamuna on a daily basis. When he turned out be old, he found himself incapable to go for the bath. On such point of time, a stream of Ganges appeared opposite Yamunotri for him so that he can continue his routine of taking the bath. Yamuna is the daughter of the Sun God, Surya and Sangya. It was believed that Champasar Glacier is the birthplace of Yamuna. 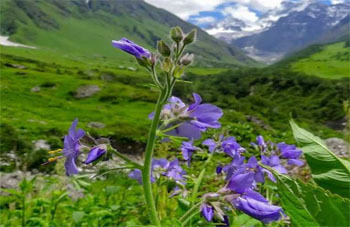 Also, the river source is supported by a mountain that is dedicated to her father Surya who’s another name is Kalind and the mountain is refereed as Kalind Parvat. Yamuna is known for her playful nature, a nature that she had developed during her childhood. Yamunotri Temple: The temple holds the ultimate importance while heading towards the Chardham Yatra. It was built by the Maharaja Pratap Shah of Tehri Garhwal. It opens on the day of Akshaya Tritiya. Janki chatti: It is known to be the middle point on the trek to Yamunotri. Located at a distance of 7kms from Yamunotri, it is the house of thermal springs. Surya Kund: It is the natural thermal spring popularly known for its hot boiling water. People tie the potatoes and rice with the string and cook them by immersing the string in the hot water. Afterwards, they distribute the cooked item in the form of Prasad. Divya Shilla: It is the rock pillar engraved at the entrance of Yamunotri temple. It receives great respect by the pilgrims when they about to enter the temple. Saptrishi Kund: It is considered as the origin of the Yamuna River. It is quite famous for its bluish water and pebbly banks. Also, Brahma lotus is famous on this kund but they are seen rarely. Hanuman Chatti: It is the point from where the Yamunotri trek begins. It offers the exploration made through lush green meadows and woody hills that fills the visitor’s trip into an amazing amusement. Kharsali: A favored picnic spot that offers lots of thermal springs and beautiful cascades. It is known for its captivating surroundings and lovely ambiance. Barkot: It is the small town located at a distance of 49kms from Yamunotri. It beholds some of the ancient temples and also serves as the best location for meditation. Trekking: Tourists can enjoy trekking to Yamunotri temple that is a full day trek. Tourist can enjoy the trek either from Hanuman Chatti located at a distance of 6km or from Janki Chatti situated at a distance of 4km. While trekkers, you get to explore rugged peaks and dense forests. 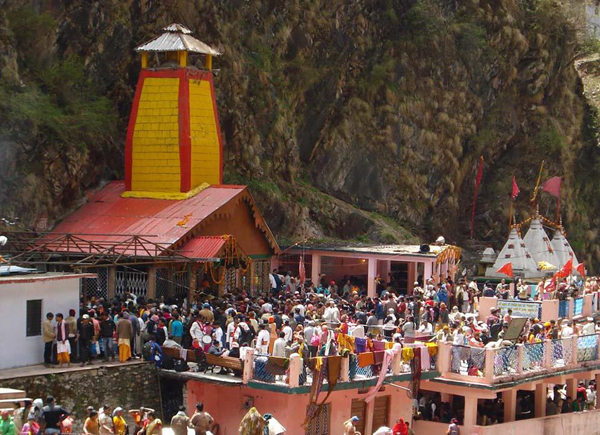 Pilgrimage: Yamunotri is mostly the first stop towards the Chardham Yatra in India. Every year, several devotees turned towards the Yamunotri temple to pay homage to the Goddess Yamuna. Weather in Yamunotri remains cold throughout the year. On an average, the temperature stand on 15-20 degree Celsius range, but many times, it falls below zero degrees mark. Thus, while on the way to Yamunotri, visitors are advised to carry warm and woolen clothes. Summers: Summer season from April to June offers cool and pleasant environment. The Yamunotri temple sets to open for the devotees in the beginning of summer season. The temperature during this season turns around 20 degrees Celsius. The nights are little bit chilly. Monsoons: Monsoon season begins from End of July and continues till August. During this season, the area is prone to face landslides that make the travelling difficult. Thus, pilgrims are advised to avoid the monsoon season to the maximum extent. Winters: Winter season takes the time from November to April. The weather remains cold during this season with the chances to receive heavy snowfall. Snowfall is enjoyable during this period. However, the Yamunotri temple remains closed during the season. Only trekkers and mountaineers visit the place for adventurous trips. The best time to visit the holy shrine of Yamunotri is from April to June and From September to November. The temple open in summer somewhere in the last week of April and remains open till November. After that it remains closed during the whole season of winters. By Air: Near to Yamunotri is the Jolly Grant Airport. Located at a distance of 210kms, the airport serves as a medium with Delhi via regular flights to Dehradun. also, the airport allows smooth connectivity with the location such as Hanuman Chatti via road transport. Also, the visitors can enjoy the helicopter services from Dehradun to Yamunotri. By Rail: Both Rishikesh and Dehradun serves as the nearest railway station to Yamunotri. Dehradun station is located at a distance of 175kms while the Rishikesh one can be found after a distance of 200kms. Both the railway joints are smoothly connected with other parts of Uttarakhand State. Also, quick and well connected road transport lets the visitors reach Hanuman Chatti from where they can begin the trek to Yamunotri. By road: Yamunotri don’t possess any direct connection via roads. Visitors need to reach Hanuman Chatti by taking any sort of rail or air transport followed with road means. Once they reach Hanuman Chatti, they had to follow a trek to reach to their destination. From the snow clad mountains to the mesmerizing lakes, Yamunotri offers unbelievable moments to the visitors. It is a legendary place that asks for some courageous moves and lots of stamina to reach. Once reached, it offers mind stilling views of the captivating surroundings.